Comedy star Jim Smith on stage at Kinloch Memorial Hall. Jim Smith, star of BBC’s Scot Squad with two sell-out Edinburgh Fringe shows under his belt, performed a headline set at the Kettins, Ardler and Meigle Guild charity concert. His show – which covered everything from internet dating advice for farmers to village night life – made £1,600 for the rural group. The money will go towards buying new defibrillators, amongst a range of other causes. 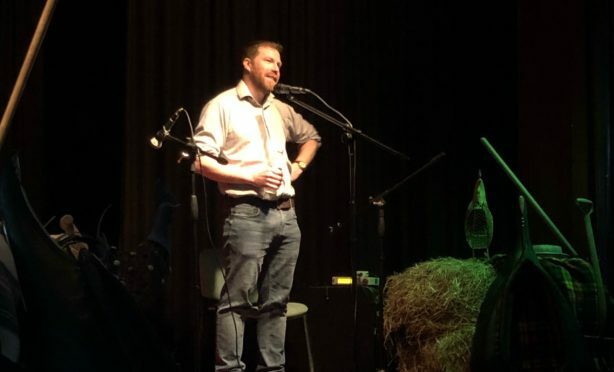 Jim, who farms near Caputh, opened his gig at Kinloch Memorial Hall by telling the audience how he had been lucky enough to share stages with the likes of Frankie Boyle, Kevin Bridges and Fred MacAuley – but they had never had a call from Kate Harris from the Kettins, Ardler and Meigle Guild. The performance was peppered with jokes tailored for the local crowd, including a routine about discos at his former school, Blairgowrie High. Jim was joined on the bill by musicians Yvonne and Lindsay Downie, who lead the Angus Strathspey and Reel Society. Guild secretary Evelyn Alexander said: “We were surprised and delighted that tickets for this event sold out within 48 hours. Ms Harris, guild co-ordinator added: “Our thanks go to all the local businesses who supported us with donations, and those who gave up their time. The money raised will be ploughed into local schools, the Ardler, Kettins and Meigle Parish Church and a campaign to buy defibrillators for the area. Donations will also be made to the Cornhill MacMillan Centre in Perth and the Royal Agricultural Benevolent Institution. Local firms and organisations that supported the fundraiser include East of Scotland Farmers, the Ardler Tavern, AJ Lyburn, South Gask Farm, MJ&J McLaren and Cornan Farm.